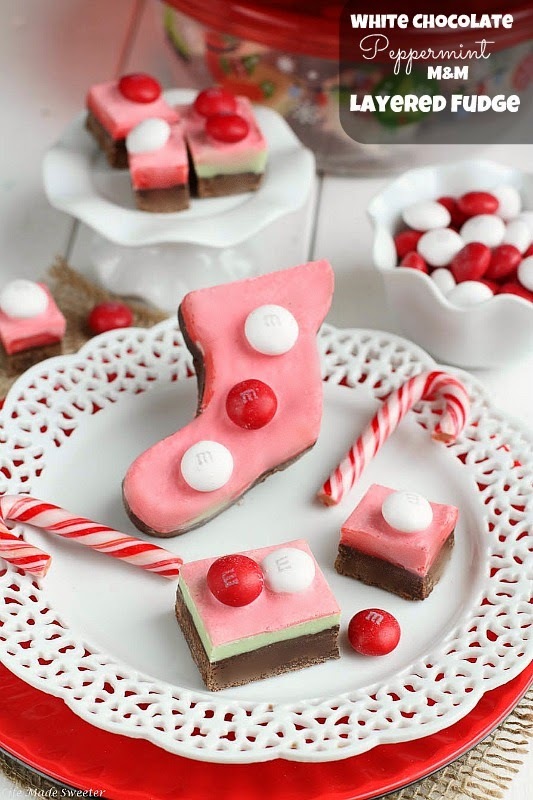 An easy layered fudge with White Chocolate Peppermint M&M’s made with only 5 ingredients and all in the microwave! The holidays just wouldn’t be complete to me without some good fudge. I always make a few batches during this time of year because they make perfect edible gifts. My pantry is usually stocked with lots of chocolate so I love making a batch of easy fudge to have on hand during this time of year. This White Chocolate Peppermint Layered Fudge was the latest batch I made and despite all the layers, it was reallly easy to make. All the layers come together in the microwave so that means no slaving over the stove with a candy thermometer. That does mean that you’ll have to be careful not to burn the chocolate by stirring thoroughly in between heating and not to heat it anymore as soon as it has melted. I think the hardest part was waiting for this to set in the fridge. Once the fudge was set, I cut them into squares and divided them into batches so that I could give them away to friends and neighbors. An easy layered fudge with White Chocolate Peppermint M&M's made all in the microwave! No candy thermometer required. Make the Chocolate Layer: In a large microwaveable bowl, combine the milk chocolate chips with 1/2 of the can of sweetened condensed milk. Microwave for 30 seconds, stir for 30 seconds, and then microwave for another 15-20 seconds. Stir for about 30 seconds or until the chocolate is melted. If it isn't melted all of the way, return it to the microwave for another 15 seconds. Once the chocolate is melted, mix in the vanilla extract. Spread the milk chocolate layer evenly on top of the parchment paper in your 8 x 8 pan. Make the Mint layer: In another microwaveable bowl, combine white chocolate chips with the remaining sweetened condensed milk. Microwave for 30 seconds, stir for 30 seconds, and then microwave for another 15-20 seconds. Stir for about 30 seconds or until the chocolate is melted. If it isn't melted all of the way, return it to the microwave for 10 more seconds. Add the peppermint extract. For two separate colors like mine, divide the mint chocolate batch in half and and add the green food coloring to one half and pink food coloring to the other half. You can choose to just color it one color or leave out the food coloring if desired. Spread both colors of the mint layers evenly over the chocolate layer. 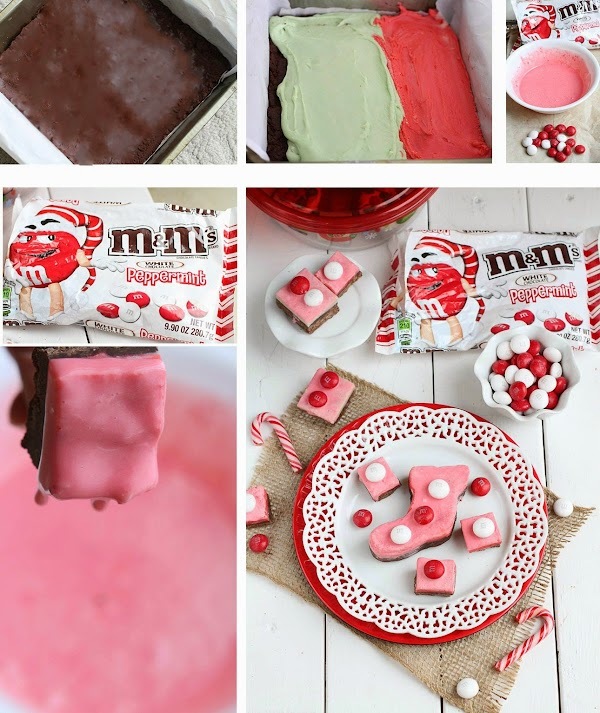 Make the White Chocolate Peppermint M&M's layer: In another microwaveable bowl, place the chopped or crushed White Chocolate Peppermint M&M's and microwave for 20 seconds, stir for 30 seconds, and then microwave for another 15-20 seconds. Stir for about 30 seconds or until the chocolate is melted. If it isn't melted all of the way, return it to the microwave for 10 more seconds. Pour evenly over the mint chocolate layer. Garnish with whole White Chocolate Peppermint M&M candies if desired. Place the fudge in the fridge and let harden for about 1-2 hours. Pull out the fudge using the parchment overhang. Cut fudge into squares or fun shapes with a cookie cutter. Be careful not to burn your chocolate in the microwave. Remember to stir the chocolate for at least 30 seconds each time you take it out of the microwave. The chocolate is still melting even after you've pulled it out of the microwave so do not over melt it or it will clump up. Stop heating it as soon as it has melted.